On May 28, Roderick Macdonald was awarded in absentia the McGill University Medal for Exceptional Academic Achievement, one of the University’s highest honours. 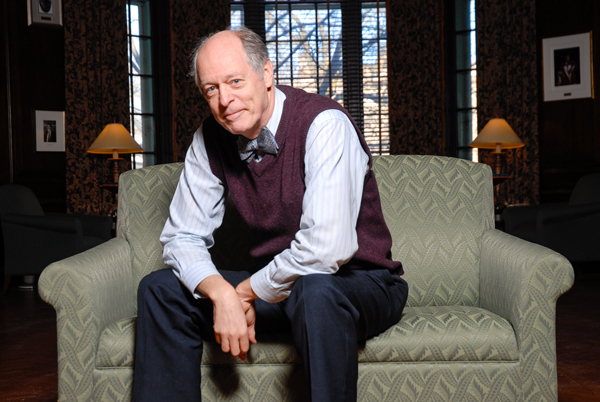 Macdonald received the McGill Medal as part of the Convocation ceremony for the Faculty of Law, where he taught thousands of students over the course of a distinguished career that spanned more than three decades. In the winter of 2012, Roderick Macdonald, long one of the professorial pillars of McGill’s Faculty of Law, stood in front of his Administrative Process undergraduate class, guitar in hand, and sang his goodbyes. For years, Macdonald had been known for pulling out his trusty guitar and serenading students in the last class – a celebration of their having taken another step down the path of life. Mission accomplished. But this time was different. This time the celebration was tinged with poignancy because, diagnosed with throat cancer on his birthday in August 2010, Macdonald had let it be known that he was retiring at the end of the 2011-12 academic year. After more than 30 years at McGill, Macdonald was giving his farewell performance. In an increasingly cynical world, Macdonald is proof that nice guys do finish first. In addition to serving as Dean of the Faculty of Law from 1984-89, he has served on a wide variety of provincial, federal and international commissions, and been a consultant to the Royal Commission on Aboriginal Peoples and the World Bank in Ukraine. In November 2008, Macdonald was elected the 111th president of the Royal Society of Canada (RSC), the first law professor ever to hold the position. Included among the prestigious awards he was won over the years are a Killam Prize (2007); the Sir William Dawson Medal for the Social Sciences by the Royal Society of Canada (2007); and the Canadian Bar Association’s Ramon John Hnatyshyn Award for Law (2010). In November 2012, Governor General David Johnston announced that the new reading room in Walter House, the Royal Society of Canada’s headquarters in Ottawa, would be named the Macdonald Room in Macdonald’s honour, following his tenure as the RSC’s president. In December 2012, he was named Officer of the Order of Canada, one of Canada’s highest civilian honours. A mensch, yes, but an incredibly accomplished one. When pressed, Macdonald will select a few highlights from his career (“Chairing the Access to Justice Committee for the Quebec Ministry of Justice, working to help bilingualize the administration of the Faculty, serving on the Canadian delegation to working group VU of the UN Commission on International Trade Law…”) but, in typical fashion, he has derived the greatest pleasure from helping others blossom. “I am most proud of the contributions I have made to the development of my colleagues, and to their accomplishments as teachers and scholars,” he says simply. Ironically, for a man praised for his abilities as a teacher, Macdonald admits he follows very few formal tenets. Like thousands of students before her, Dawe says Macdonald always achieved that goal. “Professor Macdonald approaches everything from an interdisciplinary, global perspective, and draws on research in a variety of jurisdictions and fields – legal and otherwise. He thinks creatively, and makes connections that appear unlikely,” she says. “Seeing this pushed me to broaden my own knowledge, exploring areas within law and outside law that I might have otherwise ignored, in hopes I could learn to make connections like he does. This affected my choice of courses, the extracurriculars and work I sought out, and my career plans. “Most importantly though, his approach showed me how I could still connect my previous education and professional experience – my old life, so to speak – with my law studies. Up to that point I felt that I had to leave my old life behind, and it was proving to be a challenging transition. His broad, inclusive approach to research showed me that there was room for everything and everyone. If not for the time I spent working with Professor Macdonald, I am not sure I would have continued law school after that first year,” says Dawe, who will be starting at Quebec’s École du Barreau this August.